Jon Neufeld is a Canadian singer-songwriter and a founding member of the band Starfield. 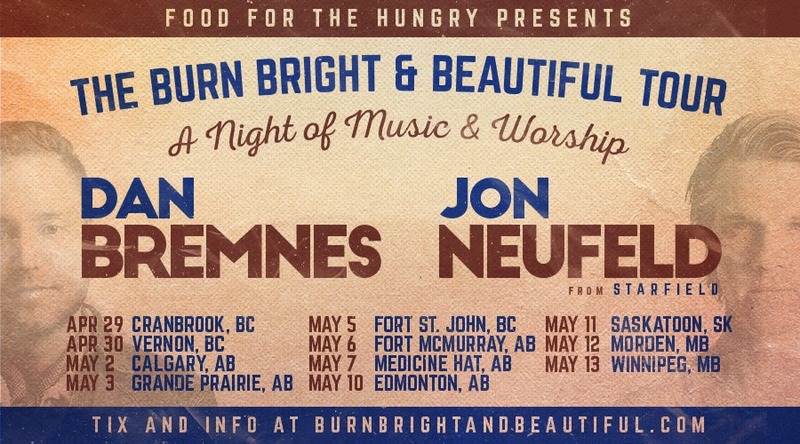 In 2014, Jon released his first solo album Burn Bright and, together with five time Covenant Award winner Dan Bremnes, will kick off the Western Canada Burn Bright and Beautiful Tour starting April 29! Q: When did you start playing music? Jon: When I was about 15 or 16 I picked up the guitar - my dad always had a guitar lying around to lead worship for small groups. Eventually, when I was about 17 or 18, my brother Tim and I started playing together - covering a bunch of worship songs from artists like Jars of Clay and DC Talk (not the rap ones - can you imagine me rapping?!). Q: Who were some of the major influences on your music and songwriting? Jon: Early on, music that impacted me was probably British rock stuff like U2, Oasis, Radiohead, later on Coldplay but, beyond that, worship music was what really stirred my soul. I felt like it opened my eyes to the Holy Spirit, to Jesus. More specifically, worship leaders like Matt Redman. Delirious was the biggest influence on my songwriting, though. Delirious was a really great example of a band that created excellent, current, interesting, honest art out of worship music. It wasn’t commercialized or made for the radio. Something about their music was just other, and it made me want to write relevant songs that we can sing in church that are “cool”, I guess! It broke through a lot of boundaries, I think. Q: Do you see a difference between songs you write for corporate worship and songs you write out of your heart as an artist? Q: What’s one of the biggest challenges in writing corporate worship songs? Jon: Often worship songs are the hardest songs to write because you’re trying to fit into a certain style that’s become the “worship music” style, and you feel like you’re dumbing down your art. You have what you think is a brilliant idea - you love it, you’ve worked on it - and then you’re like, this is too out there, I need to simplify this so that in a church a six year old and a sixty year old can catch on to it with ease. If it’s too crazy, if there are too many wild melodies, if its not something that’s catchy, then it’s not corporate worship music. Q: How do you know if you’ve written a “catchy” tune? Jon: I don’t know, but as an artist, I know when something works and when it doesn’t. It’s almost like I can feel it, I can sense it. On the other hand, I think if we made a whole record of really singable songs it might be kind of boring to listen to. I have to let myself sort of flex that artistic muscle, and make something that’s artistic and different, and say well this isn’t really singable but it stirs my spirit and it’s worshipful. It’s not gonna be sung in churches but it’s going to mean something to someone because it’s honest, it’s real, it’s compelling, and the music moves my soul. Q: Do you see a difference between playing a concert and leading worship? Jon: There are differences between corporate worship in a church service and putting on a concert - but I think try to meld those two. I think my goal for a concert is to create a night of worship that is also fun and entertaining where we laugh and we enjoy good music, but we’re also in the presence of Jesus and allowing the Holy Spirit to speak into our lives. That’s the beauty of worship leading. And that’s at my core: I’m a worship leader. I don’t really care to put on concerts if it’s not ultimately turning to the person of Jesus. If we're not in some way taking a step in his direction, it's just kind of useless. Maybe the concert portion - the lights, and the sound, and the entertainment - is just a drawing card to ultimately enter the presence of God. Q: What would you say is the thrust of the Burn Bright album? Would you say it’s more artistic singles or corporate worship? Jon: If you listen to Burn Bright, it’s sort of schizophrenic in that I basically took the best ideas I had and put them out there. They’re not all corporate singable songs but I think they all have a worshipful core. This last year I’ve been shedding layers of fear and doubt and jadedness, and finding the person of Jesus again; the songs are a little bit of a reflection of that. I think this album, as my first solo offering, is an act of worship throwing my hands up and saying “God you are great and I am not, I surrender.” I think that’s what this last year has been for me - rebuilding those foundations of faith that I think I had when I was a child. Maybe we spend our whole lives doing that, I don’t know. Q: Where do you see your music going in the future? Jon: In the future I really do want myself as an artist to be branded as a worship leader, as writing songs for the church. I’m excited for the next thing. I feel like I have a lot more to say as I figure stuff out in my mid-thirties - with two children and domestic life, I still have so many lessons to learn! Q: How did you get connected with Dan Bremnes for the Burn Bright & Beautiful Tour? 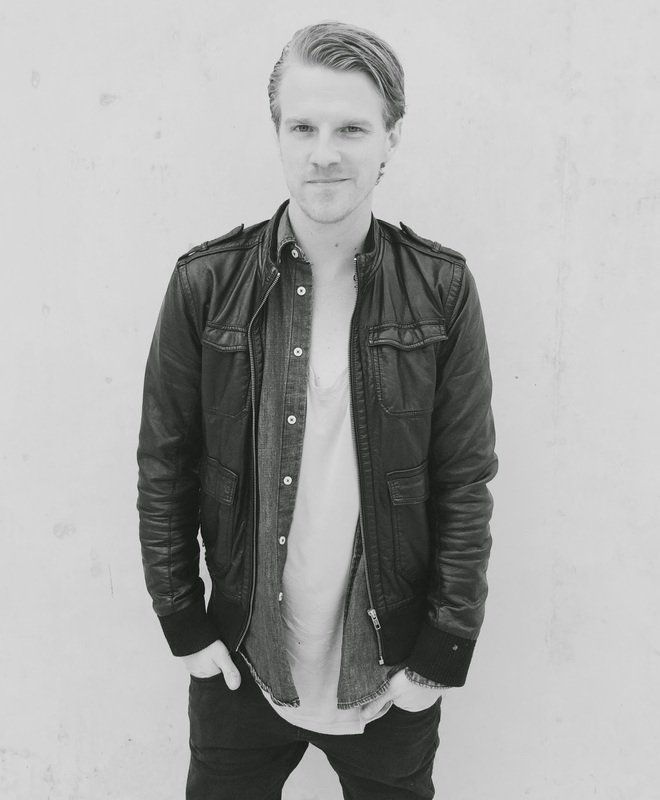 Jon: The community in the christian music scene is pretty small so we’ve crossed paths a few times. Even though, stylistically, our music is different, we felt like it was more compelling to co-headline rather than go out individually. On the tour, we’ll do two separate sets and then two or three songs together at the end of the night. It’ll be really fun, he’s a great guy and I think the camaraderie and family-like atmosphere will come through. Q: Is there any particular ambition you have for this tour? Jon: It’s really just a night of worship, a night of encouraging the church. I know God doesn't need me or Dan to come sing songs, but there is power in music. There’s power in our testimonies and in our songs that we’ve slaved over and dug into our souls to write that become the prayers of other people that, ultimately will lift up weary, burdened hearts and point them to Jesus, and allow the Spirit to transform them. That’s the hope of every tour I do. So the “theme” of the tour is just a night for the whole family to come together, be encouraged, and be sent out with a spirit of compassion. Food for the Hungry will be involved and that part of the night ends up taking our worship concert and our time together and turns it into the fulfillment, the completion, the extension of our worship beyond the walls of the church. I come into this place, I’m drawn near to Jesus, I’m encouraged, I’m built up, and I leave maybe sponsoring a child, loving my neighbours more, or building up the kingdom of God in another way. If that looks like sponsoring a child - great! If that looks like calling someone that you haven’t talked to in a couple years and asking for forgiveness, that’s great, too.